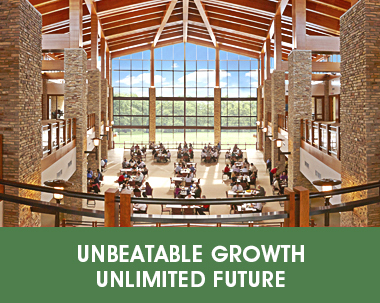 At Uline, there are no limits to what you can accomplish. If you have passion and expertise in your field and thrive in a fast-paced, results-driven environment, Uline is the company for you. We offer competitive compensation, great benefits, and an entrepreneurial culture that will push the limits of your potential. Click here to see our current openings. Uline is a business-to-business distributor of shipping supplies, industrial and packaging materials. The primary marketing channel for the company is the product catalog, bolstered by a direct sales force and full e-commerce site. Uline employees work together as a team to support the daily functions of the company, whether they fill customer orders, man the phone lines, negotiate with vendors, expand the product line or manage the finances. The administrative staff performs office duties for senior executives and supports all departments. Administrative assistants are the backbone of every department. Performs any other supportive tasks. Department plans, executes and analyzes all customer and prospect marketing events, including mailings, emails, stuffers, keyword campaigns, space advertisements, directory listings and sales team support. Maintains the appending of information and data quality of customer file. Manages the development of the prospect database. Develops and executes mailing strategies. Manages print production for catalog and other marketing materials. Plans, executes and analyzes SEM campaigns. Manages ancillary media advertising efforts. Works with sales team in providing lead information. The Creative Department fulfills all the design needs for the company and works closely with the Merchandising and Internet/Advertising departments. Maintains the "ULINE Brand" look throughout all media, including catalogs, website, mailings and other promotional and advertising channels. Designs catalog pages and maintains production schedules. Creates in-house printed materials, presentations, promotional offers, advertisements, package design and illustrations. Develops Internet/Intranet page concepts, presentations and videos. Customer service representatives function as the company’s direct line to the customer. Representatives are trained to give our customers one-stop shopping by handling orders, questions and concerns without transferring them. Representatives place orders and respond to customer questions 24-hours a day, via the phone, fax, email, chat and website. Provides excellent customer service and processes orders via phone, fax, email, chat and the Internet. Answers product and pricing inquiries. Maintains up-to-date knowledge of products and promotions. Gathers information for price quotes on large quantities and custom items. Utilizes real time/historical call statistics to provide optimal customer service. The Finance Department encompasses all financial operations of the company, including accounts payable/receivable, customer credit analysis and collection, tax return preparation, analysis and preparation of financial reporting, payroll processing and cash management. This large department takes care of everything from processing vendor invoices to setting year-to-year financial goals. The Finance Department is broken into four sub-departments: Accounting, International Accounting, Credit and Collections, and Financial Analysis. Maintains, audits and reconciles the books and records of the company. Prepares tax returns and ensures company compliance with all government regulations. Processes all accounts payable invoices. Develops and approves appropriate credit lines for customers. Calls customers on past-due invoices. Applies payment from customers to invoices. Minimizes the company’s exposure to losses from bad debt write-offs and fraud. Sets goals to determine strategic direction. Performs operational and financial audits. Identifies opportunities for improving efficiencies, reducing costs and maximizing revenues. Evaluates new markets and competitors. The Human Resources Department coordinates the recruiting, training and development of new hires, manages the benefits and compensation for company employees and maintains employee relations. Recruits, trains and develops new hires. Interviews candidates and extends job offers. Coordinates the benefits program (medical, dental, life, etc.) as well as employee compensation. Coordinates company wide internship program. Uline's Information Technology Department is responsible for creating and maintaining systems to support Uline’s business objectives. To achieve this goal, the department deploys solutions featuring computer hardware, back office systems, application software, and communications networks. Creates and maintains the Enterprise-Wide Application software for the business. Ensures network and server availability above 99.9%. Ensures quick response times to user requests and system operations. Ensures the backup and recovery of all Uline systems. Maintains the following hardware and software: IBM I-Series/P-Series servers, Microsoft Windows and Linux servers, Oracle and Microsoft SQL databases, Microsoft IIS, .NET, Java, Websphere / AIX, E-commerce and Intranet websites, WAN/LAN infrastructure, telephony, data connectivity between offices and the Internet, and email systems. The Uline Quote Department is a responsive, specialized team that responds quickly to customer requests for quotes on any of our more than 30,000 products. With their main focus on service, they also locate, source and sell products not part of Uline's current product line. Handles quoting process from beginning to end including pricing, verifying inventory, creating model numbers, placing orders with vendors and processing orders for customers. Works directly with customers to develop solutions for their business needs. Works with speed and accuracy. Builds partnerships with vendors and customers to ensure customer satisfaction. Provides customer feedback, new product ideas and trends to the Merchandising department. Maintains current knowledge of marketplace trends and offerings of our major competitors. Manages and maintains the Uline ecommerce web sites. The Internet Department works closely with the Creative and Merchandising departments. Oversees all facets of marketing and development for the Internet. Coordinates on-line and off-line sales promotions. Generates and maintains web content. Works with creative on all web designs and advertisements. Maintains and leverages the publishing content management system for multichannel publishing. Researches, recommends, and tests new internet and publishing technologies. Specifies and facilitates web site enhancements. Maintains internal keyword databases and reports. The Merchandising Department finds and selects the product for the catalog. They are responsible for vendor contracts, specifying product information, and approving creative layouts. Merchandising works closely with all other departments including Marketing, Creative, Purchasing, Sales and Customer Service. Directs new and existing product development. Tracks market trends and pricing. Maintains product management and quality assurance. The Purchasing Department is responsible for managing inventory levels to achieve the company’s goal of no backorders. Purchasing sets and reviews inventory levels at all of Uline’s various distribution centers and maintains inventory accuracy. Reviews inventory levels at the distribution centers. Orders inventory to replenish product stock. Places purchase orders and maintains good vendor relations. Performs cycle count on a daily basis. Returns damaged or unacceptable quality goods. The sales team actively markets Uline products to businesses. Each member of the team is responsible for a certain territory, where they bring in new customers and enhance existing customer accounts to ensure satisfaction. Account Representatives spend the majority of their time traveling off-site to businesses, talking directly with the customer. Works directly with customers to ensure commitments are met. Provides phone, mail and Internet support to clients. Provides customer feedback and new product ideas to the Merchandising Department. Maintains current knowledge of the marketplace, trends and offerings of major competitors. Provides packaging solutions to our customers based on needs. Builds partnerships with our customers to ensure customer satisfaction. Each Uline location is dominated by its warehouse, with each branch holding all 30,000 products in stock. All aspects of the distribution business—shipping, receiving, returns, transfers and restock—are centered within the warehouse. Picks and packs orders for customer shipments. Maintains freight, UPS, other carriers and their shipments. Audits all products upon receipt. Packs and wraps freight orders to reduce damage. Coordinates inbound merchandise and restocks. Transfers stock to other locations. Uline offers a challenging fast-paced environment for people who have a passion for what they do and provides them with the tools they need for success. At Uline, customer service is number one, from top-level executives to the warehouse and shipping departments. We are focused on providing our customers the highest quality service, the best products and the best selection they will find anywhere! Competitive compensation and excellent benefits packages. A positive, well-balanced work environment. Excellent employee communication through our intranet site and newsletter. 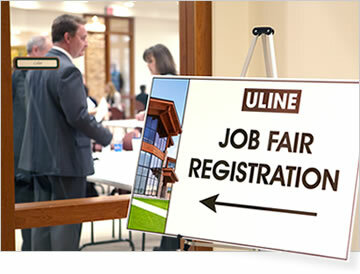 Uline seeks bright, energetic people from a variety of backgrounds to contribute their unique perspectives and help us fully understand and meet our customers' needs. Complete Health Insurance including Medical, Dental, Vision and Life. Long and Short Term Disability Coverage. Flexible Spending Plan - set aside money for health care partially covered or not covered by insurance plans. Competitive wages with annual performance and salary reviews. Employee 401(k) Savings Plan - Invest in your future. Your pre-tax contribution is company-matched 100%, up to 4% of your pay. Paid Time Off - 16 days. Use them for vacation, sick and personal days. Earn more time after 5 and 15 year anniversaries. Tuition reimbursement for job-related courses. In-house speakers, workshops and seminars. Job-related off-site seminars and training. Free, voluntary, confidential counseling. Doctor referral for continued treatment. Social activities, sports leagues and parties. At Uline, we don’t think of interns just as temporary summer help—we value them as integral team players working toward our ultimate goal: delivering quality products and services. Whether interning with merchandising or purchasing, customer service or distribution, we offer interns the opportunity to make veritable contributions to Uline. Interns are matched to a Uline department that complements their interests and career goals. Students are welcomed from a variety of educational backgrounds, including distribution, communications, information technology, business studies, graphic design, finance, journalism, accounting and marketing. Our interns meet professionals on all levels and work side by side with management and staff on projects. To help interns gauge their success, each one receives a mid-term evaluation with direct feedback from a manager. 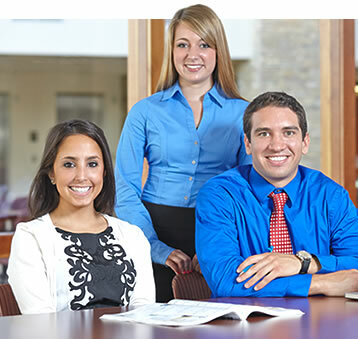 The internship program offers an environment for interns to apply their academic knowledge to real world experience and may lead to future career opportunities at Uline. Internships last a minimum of 12 weeks, usually from May until August. 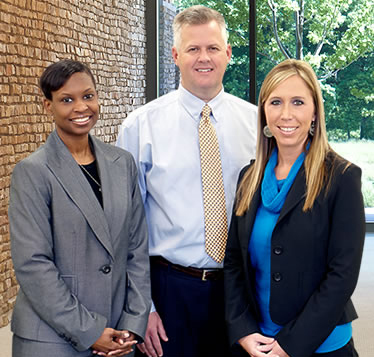 Due to tremendous growth, Uline continues to recruit top-notch, quality employees. Attend one of our job fairs and interview for our rapidly growing team!